"Campground reservations are available in blocks of one month at a time, up to five months in advance, on the 15th of each month at 7 am Pacific time. Be aware that nearly all reservations for the months of May through September and for some other weekends are filled the first day they become available, usually within seconds or minutes after 7 am! For your best chance of getting a reservation, be sure your clock is set accurately and start the first few steps of the reservation process at www.recreation.gov before 7 am Pacific time." I didn’t quite realize how lucky I was to be invited along until I flew into San Francisco a couple days before and everyone I met commented how it was a “once in a lifetime opportunity” to camp in the Valley. I usually choose backpacking over camping so I forget how desirable car camping reservations can be! I flew in Friday morning and spent the weekend catching up with my childhood friend. On Sunday morning we rented a car and drove out to the park. I have seen so many photos of Yosemite, but nothing quite prepares you for your first view of the valley. Chelsea and both gasped as we rounded a corner and caught our first glimpse of El Capitan. Our initial plan was to meet everyone at Tunnel View before we all head into the Lower Pines campground to check in. Chelsea and I waited for about an hour at Tunnel View before we gave up and drove down to camp. We hoped to set up camp and head up to Glacier Point for sunset, but everyone didn’t end up making it to camp until 7. The hour drive to Glacier Point was a little daunting after they had spent the entire day driving to the park. When we planned this trip we hoped to get Half Dome permits. The morning the lottery opened all eight of us entered and not a single one of us scored a coveted Half Dome Permit. We were a little bummed and figured we would try for same day permits once we got to the park. A week before the trip we all decided Clouds Rest seemed like a better plan and we gave up on Half Dome. 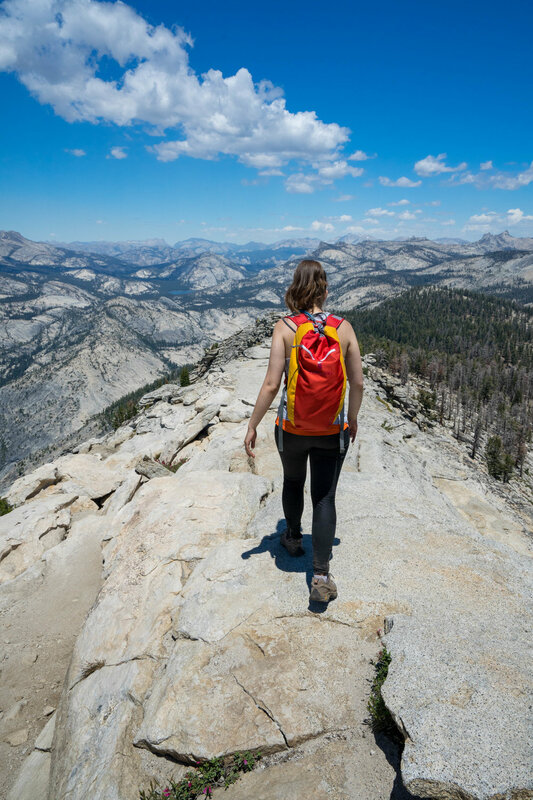 If you are interested in hiking Half Dome you can read a great write up on that here. While easier than Half Dome, Clouds Rest is no walk in the park. At 14 miles round trip with 2600 feet of gain we definitely had a long day. My group woke up at 5 am to get ready and ended up starting on the trail at 8 am, as the trailhead is an hour drive away. Something that is easy to forget about the Sierras is the elevation. Clouds Rest is at 10,000 feet and some people can start to develop altitude sickness at 8,000 feet. I felt fine, but members of our group were struggling with nausea and sluggishness on this hike. Bring a lot of water (dehydration makes altitude sickness worse!) and leave yourself time to acclimate if needed. The trail starts out going up gradually until you crest the ridge and start going down again. You lose around 500 feet of the elevation you initially gained. In the back of my head, I knew it wasn’t going to be fun to go back up that portion of the hike when we returned. The final part of Clouds Rest is a narrow-exposed ridge similar to Angels Landing, only with fewer people and no chains. Our group made it to Clouds Rest a couple of people at a time. Sergio and I made it first, then Hillary and Sarina, then Doris and Cody. My friend Chelsea sat down with Doris’s friend Euzel right before the scary exposed section. I have known this girl since we were twelve and somehow missed that she was afraid of heights! I felt a bad bringing her on a hike with this exposure, but she assured me she was fine, so I continued to the summit without her. Chelsea on the narrow section of the hike. We had been up there for a bit running around and taking in the views when I saw her making her way up to us. I terrified another group of hikers when I started screaming to congratulate her for working past her fear. Nothing excites me more than to see someone work their way through panic and make it to the top of a challenging hike. Most of us have been in the situation where panic completely overwhelms you and you think you can’t go any further. Once you manage to calm yourself down enough to complete your goal, the feeling you get at the top is such euphoria. I want everyone I know to experience that feeling as often as possible! All of the ladies at the top of Clouds Rest! We hung out for a while together at the top and then made our way back down. Remember how I said I felt fine and the altitude never got to me? Well, the heat managed to accomplish what the altitude couldn’t. We had made it about ½ of the way back when I began to feel nauseous and sick. This was right before we had to climb that 500-foot section again. Every step up I had to pause for a second or two to keep myself from hurling. I brought 4 liters of water and managed to finish it all on this hike. If you hike Clouds Rest in the summer bring a lot of water and plan on starting early in the morning to avoid the midday heat. Luckily, once I finished that uphill section I was back in the tree cover so my heat sickness dissipated. The trail ends at Tenaya Lake and we all brought swimsuits to swim after finishing our hike. Chelsea, Euzel, Sergio, and I finished first and ran to the lake to swim. There is a chance I flashed all the tourists on the far bank in my quest to quickly change into my swimsuit. The water was very shallow and the perfect temp for rinsing off after a long, sweaty, and dirty hike. The perfect mermaid rock in the middle of Tenaya Lake! Sarina and Hillary showed up next and we played around in the water for a while before things went a little awry. While we played, we remembered the ice in our coolers was melting and the store was closing soon. We had an hour drive back to camp, so four of us piled into my tiny rental car while two more stayed at the lake to wait for Doris and Cody. We made it to the valley when Doris called and said she was almost back to camp and asked if we had the guys with us. That is when we panicked. The lake is less than a quarter mile off the trail, but Doris and Cody hiked past the turn-off. When they got to the trailhead, they saw my car was gone and assumed we had all fit into it. Once we all figured out our mistake Doris and Cody immediately turned around to go get Sergio and Euzel. We went to the store to get ice and firewood for dinner. While we waited at camp, we tried to get dinner started for everyone, but we realized Doris and Cody had everything we needed to make dinner in their truck. Then we sat and panicked until Sergio and Euzel showed up, without Doris and Cody. When they realized both cars had left without them they had hitchhiked back to our campsite. When Doris and Cody got to camp we had a heated argument about, "whose fault" it was. After we calmed down we all decided it had been a communication oversight on all our parts. Sergio, Euzel, Chelsea, and I had gone with the original plan because we weren’t that tired and swimming in the lake sounded amazing. Sarina and Hillary only came back to the lake because they saw we weren’t at our car. Doris and Cody didn't come to the lake at all because they saw our car was gone. The major lesson I learned is to make your meeting plans based on the worst case scenario, not the best. Swimming at the lake was a great idea in theory, but a lot of us were too tired to consider it after a 14-mile hike. Also, if you have a group that hikes at different paces like ours, rehash your meeting plans at the midpoint of your hike. None of us mentioned again about where we planned to meet. All of us left the top with different ideas that we weren’t communicating with each other. In the end, all is well that ends well and it was definitely a learning experience for us. After our long hike with a slightly dramatic ending on day one, we decided to take it easy in the valley on day two. Everyone talked about how packed the valley would be the week of the Fourth of July, but I was still unprepared. It didn’t help that it was very hot and I was sweating out my will to live. My patience reached it’s limit when we did the short loop of Yosemite falls. We reached the base of the waterfall to find 200 people crowding the bridge and scrambling over the rocks to the base of lower Yosemite Falls. At that point started walking back to the car. On my way, I saw 20 people taking photos of what appeared to be a tree, but was actually a common bluebird. If you dislike crowds visit the valley destinations EARLY in the day or avoid it altogether. Yosemite can definitely turn into nature Disneyland on a hot summer day. I was thankful when we drove away from the falls and made a quick stop in El Capitan meadows. Afterward, we went to Cathedral Beach Picnic Area to eat lunch and relax by the Merced River. There weren’t many people there, so we all relaxed and enjoyed swimming and napping before we went back to camp to prepare for our sunset plans. Our group at El Capitan Meadow! The moment I agreed to come along on this trip I knew I wanted to visit Taft Point at sunset. Taft Point is a 2-mile round trip hike from the Sentinal Dome trailhead on the Glacier Point Road. We left our campsite around 6:30 pm and arrived at the trailhead around 7:30 pm. This hike is super flat and quick. We arrived at Taft Point long before sunset and were able to take in the amazing view while the sun went down! If you are afraid of heights this viewpoint will definitely make you nervous. It’s a 3500-foot drop to the valley below. On my initial glance over the edge, I had to battle a major wave of vertigo due to the exposure. I also panicked every time I saw someone within ten feet of the edge. If you can work up the nerve to get close enough, you will be rewarded with the most amazing view of El Capitan and the valley below! We spent a couple of hours taking photos and watching the sunset. The sky was hazy from nearby wildfires, which led to amazing sunset colors. I always feel bad being excited about a pretty sunset when it’s due to a wildfire, but the colors were amazing. At one point I forced myself to set my camera down and take in the view. Once the sun dipped behind El Capitan and the colors died down, we hiked back to the car and began our drive back to camp. View from Taft Point, it's a 3500 foot drop to the Valley floor. It was our last night together in Yosemite, so we spent time around the campfire laughing about our adventures and mishaps. While I love the hikes and views, this is my favorite part of every camping trip I take. I didn't know three of the people that came along on this trip and now they feel like close friends. Something about camping draws me closer to the people I do it with. Doris, Cody, Euzel, and Sarina all needed to drive back to Seattle at 5 am the next day. We called it a somewhat early night before we all had to wake up early and break up camp. After everyone left, I hoped to do a final hike to Mirror Lake, but my friend Chelsea had too many blisters from Clouds Rest and Taft Point. Instead, we opted to drive through the valley one last time and stop at Tunnel View. It seemed fitting since we had started our trip there! We stood together and took in our final view of the sleeping valley before making our long drive back to San Francisco. There may have been a communication mishap and some stress that followed, but my time in Yosemite was still amazing. I can’t wait to go back and discover even more of this beautiful park. Next time I am hoping to score a backcountry camping permit and get off the beaten path!